a ruth andrew blog. finally! a place to put all my words. Today is a two-cups-of-coffee morning for me. I’ve decided to write about the visit to my home town of Pensacola, Florida, the year my daughter and I decided we needed Mama Ellis’ recipe for her delicious Chicken and Dumplings, which she made for the family every Sunday. Early that Sunday morning I greeted my grandmother in the kitchen when I heard her walking down the hallway with her creaky walker. My pen and notebook were ready. Mama Ellis had reluctantly agreed to give me her recipe. Before I knew it, Mama had flour on the kitchen counter and flour in a bowl. “Just use what you need so the dough holds together,” she told me matter-of-factly. She held up a water glass. “Just a tumbler full, Honey.” I made a note to measure the water glass later to see how much flour it held. Next she tossed water into the bowl with the tumbler of flour. She didn’t stop to answer, intent on patting down her obedient ball of dough, sprinkling around more flour and getting ready to roll out the dough on the counter. She’d have an easier job of this if she had a wooden cutting board, I thought, but not having one didn’t slow her down. I knew she was trying to be helpful, but shortening had also gone into her bowl and was now a part of this silky ball of dough. How on earth had I missed that step? Didn’t matter now. It was too late. I watched as she grabbed the salt shaker. One tumbler of flour. Add shortening, salt and water, I wrote down quickly. Mama wiped her hands on her apron again, confident that the dough felt exactly right. She sprinkled on more flour and began to work magic with her rolling pin, not even shifting gears as she rolled the dough into long, even strips from years of practice. She cut the strips of dough into equal lengths and dropped them into a pot of water on the top of the stove, which I noticed for the first time. She stood with her hands on her hips. “You know good and well you can’t have dumplings ‘less you’ve got a hen stewing. Put the hen on early.” There it was ~ a large fat stewing hen that would soon have meat falling away from the bones. A hearty chicken aroma began to fill the kitchen. How on earth could I have missed that? Concentration, I told myself, fumbling with my notebook. The family hovered in the hallway. The table was set. Ice cubes clinked in glasses. Sweet tea was poured. Stew one hen I pencil into my notebook. Start early. 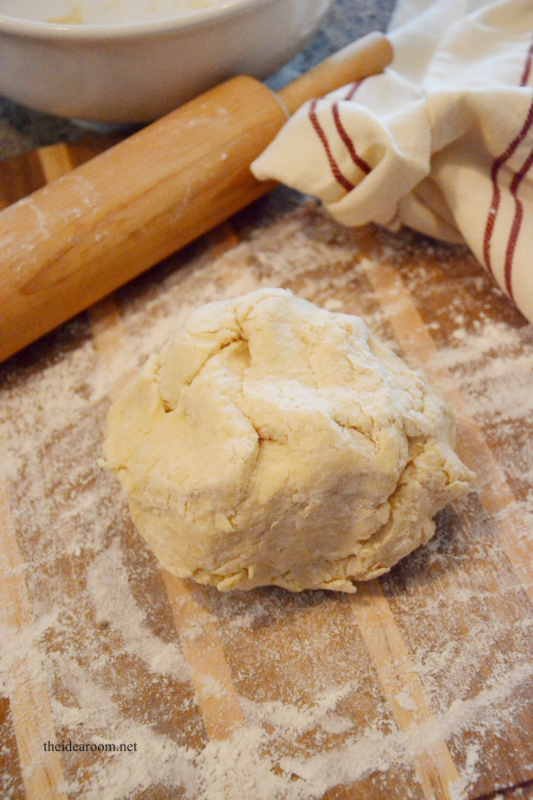 Make your dumplings with ‘just enough flour, water, shortening and salt’ so the dough holds together. Roll out & cut the dumplings into strips, then drop one at a time into boiling broth from the stewing hen. Slowly I began to understand my grandmother. Southern women were independent. Always able to ‘make a meal out of anything’ as Mama Ellis was fond of saying. For years women of her generation did not have cook books. Recipes were passed on by word of mouth. We watched the noodles fatten up, thickening chicken broth as they cooked. I asked one last question. Sheepishly I peered into the oven at a pan of fluffy biscuits, which Mama had slipped into the oven while I tried to figure out what size hen to cook. Only then did I see a freshly baked peach pie, also baked earlier that morning, cooling on the counter beside the stove. The coconut cake had been baked the day before and waited now on the buffet in the dining room. I felt inadequate. Start a pan of biscuits I penciled in at the top of my recipe. In parenthesis I wrote ~ Make a cake the day before. Use a mix. Forget the pie. I smiled at my grandmother, shorter than me now, and gave her a loving hug. She hugged me back, with brittle bones and arthritic knuckles. I saw tears in her eyes which she wiped away with the corner of her apron. We both knew we would not have many more visits like this. “Mama doesn’t use recipes,” I told her. She lives in Georgia now, loves to bake home-made biscuits and Sweet Potato pie, and never bothers to time her biscuits or pies when she bakes. She knows when they’re done. I’m not sure she’s ever made Chicken & Dumplings, but I don’t doubt for a minute that if she did, they’d be delicious. After all, it’s part of her DNA. A Southern writer living in the Pacific Northwest. I appreciate these thoughts. Thanks so much.